In September this year, the APRC 2017 Conference was held in Ulaanbaatar, Mongolia. It was a two-day event consisting of presentations, workshops, ‘trend sharing’, and case studies. The APRC 2017 Conference brought together the experiences, cases, methodologies, and techniques of marketers, branding agencies, market research companies, and experts from all over the world on: co-operation of brand owners, market researchers, and other stakeholders, and advantages of understanding the insights of markets and customers for creating strong brands, exploring the local market, and entering the international market. At the conference, new trends in market research, technological solutions, and methodologies for MR, and possibilities for usage of MR results for marketing strategies and planning were introduced. Section One of the conference was titled ‘Explore Local, Lead Global’. Andy Zhao, MD of North East Asia, GfK Consumer Choices, kicked off the segment with a presentation about the Market Research Industry Development in China and Asian Developing Countries. Next, Victor Yuan, Chairman of Dataway Horizon, spoke about the Global 1985s Phenomenon and New Brand Opportunity. Bum-Erdene, CEO of MMCG, emphasised the Importance of Collaboration in Building Effective Consumer Research, before the session broke for a coffee break. After 30 minutes of synergistic networking, delegates returned to a Brand Growth Story: Journey to Top Global Player from Local Giant, told by Yang Jungyul, CEO of Kantar Insights Korea. Atsushi Yamamoto, Director of Global Marketing at GMO, and Pavel Vilensky, Marketing Manager at Wakoopa, concluded Section One with insights on Online Shopping Behaviour in Asia. ‘Growth Hacking’ was the topic in Section Two, where speakers focused on digital, technology, and the IoT. Shen Hao, President of CMRA, opened the session by articulating the current trend and development of Market Research in China. A joint presentation by Kantar Insights was next, talking about Unlocking Growth through Insights Technology. Just before tea break, Debrah Harding, MD of MRS, gave an update on the New European Data Privacy Laws, and Dave McCaughan, Chief Strategy Officer of Ai.agency, spoke about using artificial intelligence platforms for undertaking market research. To wrap up the section, Dr Huh Chung-Ling presented on Big Data in Social Media being the New Trend of Marketing. 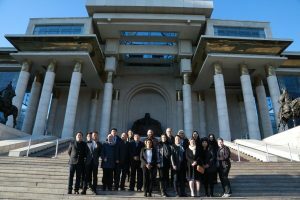 The conference ended with a one-day cultural program for delegates, with visits to various scenic attractions in Mongolia.